Udall opened, standing next to Bennet, saying the outcome of the race was never in doubt. Everyone laughed. Diana DeGette, Jared Polis and Ed Perlmutter were right behind them. Clinton supported Bennet's opponent, Andrew Romanoff, in the primary. But Romanoff has also been campaigning for Bennet since then. The Ken Buck misconduct charge ad has played three times in primetime tonight that I've seen. I hope it's having a good effect for Sen. Bennet. In other local news, Prop. 62, the Personhood Amendment seems destined for defeat. Update: Gov. Bill Ritter and Sen. Mark Udall are with Sen. Bennet at the Bennet celebration. Sen. Bennet made some gracious comments about Andrew Romanoff. At his election party, Romanoff expressed his support for Bennet and asked his supporters to do the same. Ken Buck said voters will have a clear choice in November: "between conservative Ken Buck and Liberal Michael Bennet." He said the differences between Buck and Jane Norton were miniscule by comparison. Norton asked her supporters tonight to support Buck. The Republican gubernatorial primary is still too close to call, between Scott McInnis, recently beset by plagiarism issues, and Dan Maes, the Tea Party-supported candidate. 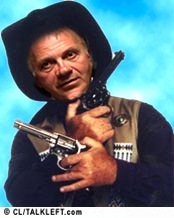 If McInnis wins, Tom Tancredo is waiting in the wings. The Democratic candidate, popular Denver Mayor John Hickenlooper, should be shoo-in, particularly if McInnnis and Tancredo are both in the race, splitting Republican voters. Andrew Romanoff seems like a nice guy. He really wants to be Senator. If I met him at a social event, I bet I'd like him. If he gets the Democratic nomination for U.S. Senator for Colorado, I'm sure he'll be much better than his Republican opponent and I'll vote for him. Salazar said Sunday he would like to provide recommendations on filling two vacancies in U.S. District court in Denver as well as picking a new U.S. attorney and marshal before stepping down later this month. Before leaving, Salazar said he'd also like to pass eight bills dealing mainly with wilderness and conservation issues. One would define bans on mining, timber harvesting and new roads and constructions in Rocky Mountain National Park. Another would establish the Sangre de Cristo National Heritage Area. Someone needs to tell Sen. Salazar it's time to move on.